The first time I went to Greece my jaw literally hit the deck. If there’s one thing that has stuck with me since my first trip there over 10 years ago it was the meat…..and the Zatziki……and the tomatoes…….and the Ouzo…..and the BBQ’d goat….and the sea……and the olives…….and the…..well you get the idea yeah?This dish is nothing compared to the food I was given at a Greek BBQ we were invited to – all that was served was a huge bowl of the greatest Zatiki and big lumps of non-descript hunks of goat, stuck on two swords and thrown directly onto hot coals in a pit in the ground. This was all washed back with mountains of Raiki and I’ll tell you this…..it was heaven!! If you can then cook these ‘hard’ on a flaming hot BBQ – you want pink in the middle and a healthy deep chared colour on the poutside. 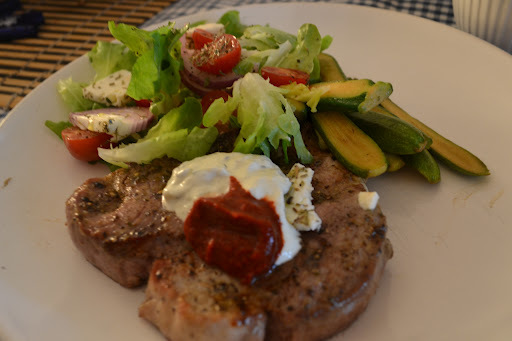 Kick off by marinating the lamb for 24 hours in all but the salt (leave that to the last minute – just before cooking). When you ready to roll the sling onto your BBQ or under the grill. 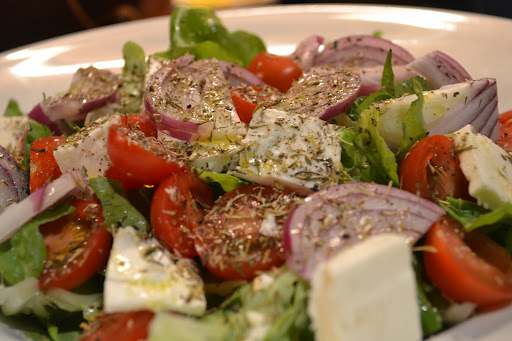 Serve with a healthy dose of Zatiki (recipe on this site) and a Greek style salad – see pic above.